A year after news of the ‘Brexit’ shook the world, more countries are threatening to leave the European Union. France, Spain, Germany, Greece, Italy, Sweden, Denmark, and the Netherlands are all at risk of jumping ship. Simply put, the EU is disintegrating. It’s not a slight risk, either. It’s not a fanciful doomsday scenario that won’t ever come to fruition. It is a real and present threat to the global economy — one that would have dire ramifications. 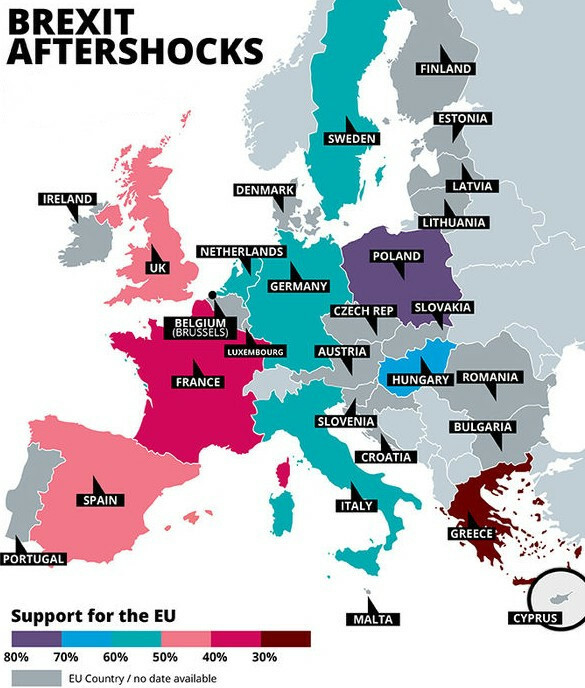 Greece will be the epicenter of any EU collapse. For years now, the country has teetered on the brink, unbalanced by its massive debt burden. The problem first erupted in 2010, when it became clear that Greece’s economy would collapse without intervention. You see, Greece adopted the euro in 2001, and over the next seven years the country's per capita GDP nearly tripled. Encouraged by that growth, the Greek government vastly increased public spending. It used debt to finance higher public wages and costly infrastructure projects, including the 2004 Summer Olympic Games in Athens. At the same time, government deficits were surreptitiously underreported. For years, the country recorded very high deficits above 10% of GDP. But when Greece was being considered for euro-inclusion, the government submitted data that showed a deficit below 3% of GDP (the level required for a member country to join the Eurozone). This proved to be a deception. When the financial crisis hit, Greece’s economy contracted. Sharply. GDP fell by 20% from 2008 to 2010. And the Greek government was no longer able repay its creditors. Tethered to an economic anchor, the European Commission opted for bailouts. The first bailout package in 2010 totaled 143 billion euros over three years. The second brought the total amount of Eurozone and IMF bailouts to 246 billion by 2016. 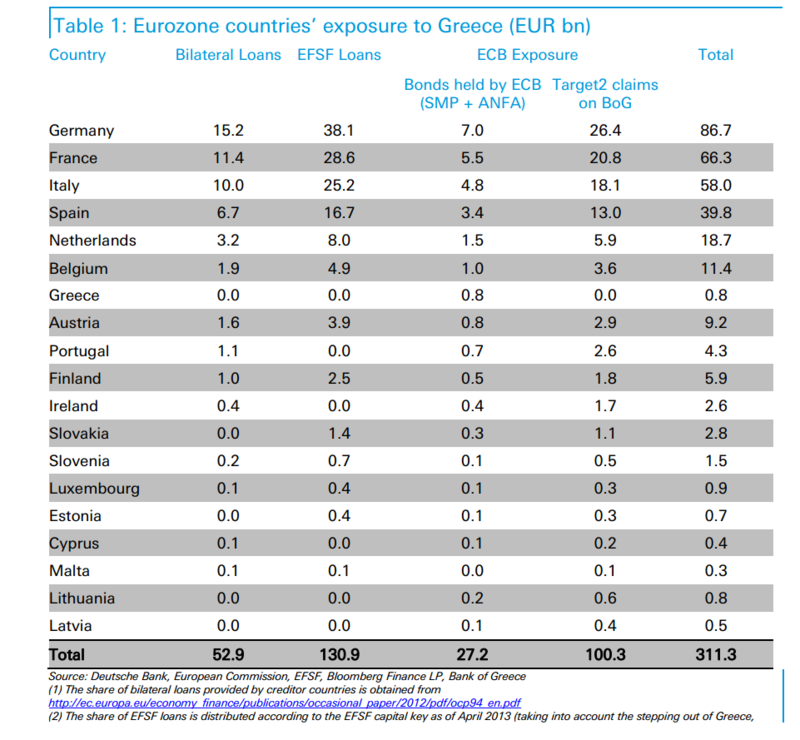 And in 2015, a third loaned up to 86 billion euros gradually from 2015 until June 2018. Of course, the bailouts came at a price. Crippling austerity measures were imposed on the country, as it struggled to recover. These austerity and reform policies were meant to rein in Greece's’ debt, but they’ve also turned the country’s recession into a depression. Unemployment is languishing above 20%, the highest in the EU. And 22% of the population is "severely materially deprived,” according to Eurostat, double what it was in 2005. So the position of many everyday Greeks is that the country ought to just leave the EU, and default on its debts. This sentiment prompted the election Prime Minister Alexis Tsipras, whose leftist-led government pledged to beat back the EU’s rigid austerity measures. Since then, bailout discussions have become more contentious, with both parties reaching loggerheads. The problem, of course, is that a “Grexit” wouldn’t just affect Greece. It would send shockwaves through the EU. And Germany, in particular would bear the brunt. Germany, more than any other EU member, has footed the bill for the Greek bailouts. All told, the country’s exposure stands at 86.7 billion euros. France’s exposure ranks second at 66.3 billion euros. For that reason, Germany has taken a hard line in negotiations, bristling at calls for debt forgiveness. Indeed, the IMF has threatened to walk away from the bailout altogether, saying Greece's debts are so huge that it won’t ever be able to pay them. It’s demanding the Eurozone reduce the country’s debt burden to make the repayments more sustainable. This is a nonstarter for Germany. But without debt relief, Greece would have to force further austerity on an already exhausted population — something its government refuses to do. It’s genuinely a lose-lose situation. Greece needs money it simply doesn’t have and Germany, understandably, has no interest in throwing good money after bad. Especially if Greece is balking at making any more concessions. Furthermore, Germany faces national elections this fall, and Angela Merkel’s Christian Democratic Union (CDU) doesn’t want to be seen to be letting Athens off the hook in an election year. Far-right figures in the Alternative for Germany (AfD) party have already promised to call a vote to leave the EU if they get into power. "I know the German people want to be free of EU slavery,” AfD chairman Bjorn Hocke said. Left Party leader Sahra Wagenknech has also called for Germany to hold its own referendum on key EU decisions such as trade deals. “I believe that it’s right to give the people the chance to vote on important issues like the planned free trade TTIP deal, or other European agreements,” she told Die Welt newspaper. Again, none of this is good for Greece. If Germany’s political climate won’t allow debt forgiveness, a Greek default and Grexit are certain to take place. Meanwhile, the German government will walk away with pennies on the dollar for its debt investment. And the German people could feel so embittered that they, too, vote to abandon the EU and any future interventions in neighborly affairs. And if Germany goes the EU will cease to exist. While the debt issue is the main wedge dividing the EU at the moment, not all of the bloc’s problems are economic. Many European citizens feel their cultural identity has been diluted by EU inclusion. They are distrustful of immigrants and global markets. This has led to an uprising for nationalist demagogues, who are calling for EU disbandment and a return to a more traditional national identity. As a leader of the Brexit movement, Nigel Farage warned that Muslim immigrants were "coming here to take us over." And in 2013, he called on the British government to accept more refugees from the Syrian Civil War — but only Christians. Farage also said he would feel "concerned" if a group of Romanian men moved next door to him. When the interviewer asked what would be the difference between Romanian men moving next door and a group of Germans (Farage's wife is German), Farage replied: "You know the difference." “What I said during the referendum campaign is I want my country back,” Farage pronounced as he left office in the wake of the Leave vote. He also predicted Denmark, the Netherlands, and Sweden would launch their own referendums to leave the EU. That prediction has at least partially proven correct. In the Netherlands, Geert Wilders continues to call for a “Nexit” even having lost in his bid to become prime minister. “The European Union is a political bureaucratic organization that took away our identity and our national sovereignty,” says Wilders. “So, I would get rid of the European Union and be a nation-state again." In France, where the first round of presidential elections is in April, far-right candidate Marine Le Pen is making a strong push with calls for independence from Brussels. In addition to being the nationalist candidate, Le Pen is also the daughter of a noted anti-Semite and holocaust denier, who’s been convicted of racism or inciting racial hatred at least six times. She’s promised to hold an EU referendum within six months if she gets into power next year. Jean-Luc Mélenchon, leader of the far-left party Front de Gauche (FG), is also pushing for France to leave the EU. So, too, has another presidential hopeful, Bruno Le Maire, a former secretary of state for European affairs. More than 60% of French people view the EU unfavorably, according to the latest research by the Pew Research Center. And another survey by the University of Edinburgh found that over half of French voters also want their own in/out referendum. If there were an EU referendum in France, 33% would vote to leave, 40% would vote to remain and 22% were undecided, the study found. Like Germany, France is an integral part of the EU and, again, the second biggest holder of Greek debt. So how should investors safeguard their finances? What steps should be taken to protect against EU disintegration? Well, when the Brexit referendum passed, markets imploded. The pound sterling was eviscerated, falling 10% in just six hours. London's premier stock exchange, the FTSE 100, has shed more than 7% in the same amount of time, wiping out more than 100 billion pounds in value. Other exchanges collapsed in sympathy. The German DAX index shed 7%, while the CAC 40 in France fell 9%. Asian markets were thrown into turmoil, as well. The Japanese stock market briefly suspended trading as the Nikkei 225 plummeted in the biggest one-day fall since Fukushima in 2011. The Nikkei closed down more than 1,250 points, or 7.92%, in Tokyo. The yen surged, briefly trading below 100 yen to the dollar for the first time since November 2013. The yen, of course, is one of the world’s weakest currencies. It says a lot that it strengthened in the wake of the Brexit. Obviously, the dollar strengthened, as well. If another major EU pillar falls, one would expect to see the euro collapse. Funds would immediately flow into safe havens, namely precious metals and U.S. Treasuries. While markets around the world tanked following the Brexit vote, gold mining companies bucked the trend in a big way. Many gold and silver mining stocks experienced double-digit gains. The price of gold itself, popped off for a 5.3% gain, climbing to $1,330/oz in the early goings. Silver was up 3.5% and platinum 2.2%. These are the trends that would repeat, should another EU member pull out.